Pioneers in the industry, we offer electrical rubber mats, extruded rubber profiles, neoprene mat, rubber extrusions and rubber screen mat from India. These mats are highly cherished by our clients for durability, accurate dimensions, fine finish and high tensile strength. Further, these rubber molds are manufactured using quality approved rubber in compliance with international quality standards under the guidance of our highly skilled professionals. These Electrical Insulation Mats are offered in various specifications at market leading prices to the clients. High Di Electric Strength up to 69 Kv. Insulation Resistance 2.08 x109 ohms. Resistance Rubber Mat The upper surface of the rubber mat, Resistance Rubber Mat will Rubber Chequered Patteren. 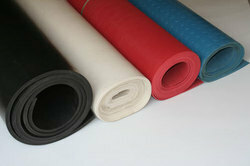 Looking for Electrical Rubber Mats ?